Thrifts are members of the plumbago family, Plumbaginaceae, that also includes leadwort (Ceratostigma) and statice (Limonium) . There are about fifty species but only a few are considered good garden plants and are used for edgings, at the front of the border, or in the rock garden. Most of them are native to Mediterranean areas and tolerate seaside conditions with full sun and poor soil as a long it is well-drained. 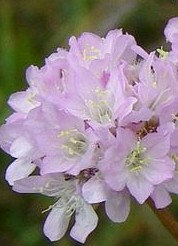 The grassy evergreen leaves produce tufts with wiry leafless stems carrying solitary, dense, globe-shaped heads of small pink or white flowers well above the foliage. 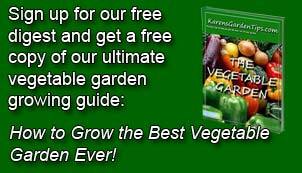 Plants can be propagated by division and seed. The species differ mainly in stature and the size of leaves with some flower size and color variation . 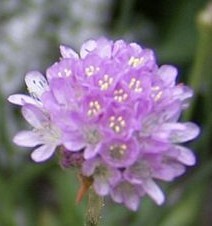 A native of Europe, common thrift has narrow dark green leaves four to eight inches long. The flower heads are 1-1/2” across and persist for two to three weeks. Many cultivars are available differing primarily in color. The flowers last two to three weeks and flowering can be prolonged by deadheading. Needs afternoon shade in the South.The cultivar ‘Robusts’ is 12-15” tall and has flower heads up to 3” across. Native to Spain, this diminutive version of common thrift (Armeria maritime) and only 2-4” high and has pale lilac pink flowers . The plant has narrow leaves and is densely tufted. ‘Bevan’s Variety’ is slightly larger at 5” high and has flowers that are rose colored while var. splendens has flattened leaves and bright pink nodding flowers. The erect, wide (1-2”) leaves of this thrift distinguish this native of central and southern Europe from the two species above. The flowers are pink, ¾” across, and oblong. The cultivar ‘Bee’s Ruby’ has intense bright pink flowers carried on stems up to eighteen inches long. With flower heads one to two inches across, this native of Portugal has the showiest blooms. The mature leaves tend to be floppy and are up to ten inches long.